Day 4 Winner Announcement: First, let me announce our winner (via Random.org) of this giveaway series from Day 4. Congratulations to Angie D! She will receive the Pixi Ultimate Beauty Kit. I'm still enjoying reading all of your answers to the Question of the Day, and I thank you for playing along! Our Day 4 Question was What’s the best thing that’s happened to you since last Christmas/Holiday Season? Our winner answered I became an Auntie...again! Day 6 of our 12 Days of Holiday Cheer Giveaway features a $25.00 HSN Gift Card, which will be electronically eMailed to the winner. HSN offers a wide variety of products, but I shop there most often for beauty products. 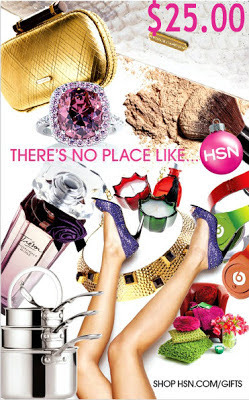 Deborah Lippmann, Lorac, Lancome, Shiseido, and Paula Dorf are some of my favorite brands I shop for at HSN. I always play their Spin to Win game (see the "arcade" icon in the upper right corner of their home page) and it's an easy way to end up with free shipping or 15% off your order. Here's a reminder of the rules: Just answer the day's question (below) and leave your eMail in the comments (or check back to see if you've won if you don't feel comfortable leaving your address. You can then eMail me at mej0620@hotmail.com). U.S. residents only, Followers only (includes Google Friend Connect, subscribers, social media followers). 12 Days of Holiday Cheer Question Day 6: Let's pretend...I do a lot of pretending about these kinds of scenarios! You've won a $500.00 gift card from the office Holiday party, but you can only use it to purchase products from one brand of higher end cosmetics (just not drug store cosmetics, but anything that you consider higher end). What brand do you choose? My Answer: I would probably say Tom Ford. I do buy some higher end make up like Chanel and Guerlain, but I try to be selective for financial purposes. I don't have anything from Tom Ford, and I do like what I see from that line. I just haven't been able to justify $48.00 for one lip stick! But then again, I could step it down a notch and buy a lot more pieces for $500.00 from Hourglass or Becca than I could Tom Ford. Nope, I'm going to indulge myself and stick with my original answer. Tom Ford it is! I'd spend it all at Cle de Peau! If I had to choose one brand it would be Perricone. I love their moisturizer. That's easy for me! I'd choose MAC. I consider them high-end and could get a huge variety of products for that amount. Hmm. Probably Guerlain. Everything they make is beautiful! I would spend it on Dior or Chanel. I would choose Chanel <3 It's classy! Either Cle de Peau or Le Metier de Beaute! Dior. I have one of their eyeshadow palettes (a splurge!) and it's like butter. I'd love to have some others, and their foundation, and nail polish....and right there my champagne tastes are over my beer budget! I would have to choose Dio! I'd choose Tarte. Their selection isn't the largest but I love all their products so much! I'd definitely stock up on MAC. They have such a great selection of both basics and unique, trendy colors. Theres a Prada perfume that I want, so either that or Givenchy. I've seen some lovely nail polishes by them lately! MAC all the way! There is so much that I want to try from MAC and they also have gorgeous polishes. Runner-up would be Urban Decay. I would choose either Burberry or Dior. I'd go with Tarte all the way... Love their stuff. They need to start making nail polish! I think YSL, but then I haven't gotten to try them much because of the prices! I really would want to spend it on laura mercier products but my wishlist of urban decay is soooooo long! I'll have to choose UD! I would spend it all on Clinique! Oh I would go for Dior all the way! :) Such a magnificent treat!